Building Information Modeling or BIM is an intelligent 3D model-based process which creates information models containing both graphical and non-graphical information in a shared repository for digital project information called Common Data Environment (CDE). It renders architecture, engineering and construction (AEC) professionals the knowledge and apparatus to be more resourceful and competent in planning, designing, constructing and managing buildings and infrastructure. Improvement of productivity and reduction of costs: By the virtue of the integration of so much information in one model, it easily becomes the single point of reference. This in turn cuts down on cross-references and approval timings and improves the overall communication and the operational efficiency during the construction phase. This results in greater productivity in a specified amount of time and thus reduces cost and the production timing. Decreased rework: Traditionally, there would be a lot of unclear information between designers and executioners and a lack of updates and differences in changes in design information. This would lead to major and minor reworks which affected the company finances a lot. But now, with BIM technology, all the information is centralized and thus, it is easier to make instant changes or updates. This has enabled uniformity of information which now results in negligible construction errors. Related documents are provided: Even though infrastructural designs are authenticated with a lot of 2D and 3D drawings, they lack other very important details like contract agreement details, bids, bills of purchase, building and government specifications, schedules etc. Introduction of BIM in this stage is very important now to fill up all the information holes and bring about an additional coordination. BIM also improves on 2D drafting, rendering a view from every angle, of the building and as well as the elevation. This is instrumental in rectifying errors. Complete project work snapshot is submitted: Generally, one department is never aware of the mechanisms and workings of the other departments in the overall project. What building information modeling does is that, it gives stakeholders, engineers, designers, managers etc, the complete overview of the project and they can access all the information regarding cost estimation, progress, planning, assessment etc regarding the project. Coordination is improved: With BIM, all the departments can work in coherence with each other, indexing their work in centrally located BIM data. Enhancement of customer satisfaction: BIM ensures that work is done smoothly with enough transparency and coordination. This results in consistent results and increased customer satisfaction. This article will explore 4D, 5D and 6D dimensions of BIM modeling. 4D BIM modeling (construction sequencing) : 3D BIM is the most common and familiar dimension of BIM, but 4D BIM adds the extra dimension to the BIM models. 4D BIM adds scheduling data of the project even before the construction has started. 4D BIM can be used to see how the project will develop sequentially using project information and visualizations. The project information would also comprise of time-related information regarding how much time it will take to install a particular thing or construct and the time needed to cure it too, so that it becomes operational. Thus, this enables the visualization of the structure at each stage as it gets built. The data is linked with the graphical representations of components or systems. Being able to figure out how the construction will look and how the assets will come together even before the ground is dug, leads to curbing of wastage of time and finances. This comes handy even when communicating with stakeholders, as this can be used to give everyone a clear understanding of how it will visually look. Also, going through the sequencing at the initial stage, even before the real site is dug, allows assessment of various possibilities that can be explored and this can inspire confidence in the team with the final design, and the time frame being good to go with the work at hand. Working with 4D BIM doesn't mean that the planners are negated. They still remain an integral part of the project team and they shape and influence proposals from a very early stage in the production and add more value to the team by being informed about other people and their progress in the whole process. 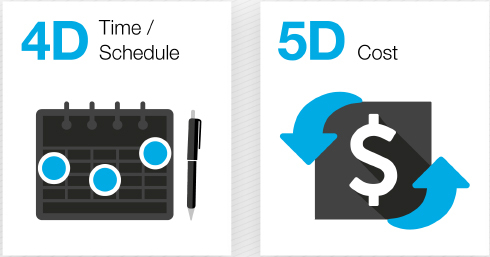 5D BIM modeling (cost): 5D BIM consists a higher level of detailing, and depicts the accurate cost information of the project. It is not an overall financial assessment of the project, but a detailed financial information data of every single part of construction. It might include capital costs (costs of investing in the construction materials etc) , running costs, and costs of renewal or replacement. All these information are linked to particular components and then their costs are calculated on the basis of the input data and the associated information. All this information enables the cost managers to easily deduce the quantities of the materials required too, thereby reaching an overall cost assessment for the entire development. This also helps in regular cost reporting in order to check efficiencies and that the project stays within the stipulated budget. The accuracy for this data feeding obviously depends on the data produced by multiple teams and shared within the Common Data Environment (CDE). If that data fed is inaccurate, then any costing calculations based on it would be inaccurate. This is the reason why quantity surveyors and estimators are still so important. An information model usually consists of three types of quantity: quantities based on actual model components, quantities derived from model components and non-modeled quantities. An information model can be queried any time during the project and the cost report information being fed is regularly updated. The budget is planned by the planners around the living costs and this helps in the involvement of the cost managers from the very beginning of the project. Other than this, there is 6D BIM modeling too or integrated BIM modeling or iBIM modeling. It offers an easy way to deduct information on say, the manufacturer of a component, the installation date, the maintenance cost, configuration information for optimal performance, along with lifespan and decommissioning data. This enables easy graphical interrogations regarding the information that would earlier be hidden under paper work. This integrated BIM services really comes into effect when while allowing facilities managers, for pre-planning maintenance activities, potentially years in advance. This planned and pro-active process offers significant benefits to the entire process.